The Toffee shade of the Fit Me powder blends in effortlessly with your skin and provides a smooth, natural finish. This shade leaves a true-to-life finish on your skin, makes it glow, and adds incredible elegance to your stylish look. The Fit Me powder can be applied over the foundation or even without it. This makes the Fit Me powder easy to carry and convenient to apply any time to suit your needs for an occasion. Also, the effects of this powder are long lasting, thus keeping your worries at bay throughout the day. The Fit Me powder does not come with any undesirable substance like oil or wax. This powder can suit any skin type and make your dull skin look fresh and natural, making it breathe. Suits your Skin"
The Fit Me powder is suitable for use for any skin type. It works perfectly no matter if the skin is dry or oily, and gives an amazingly fresh skin. 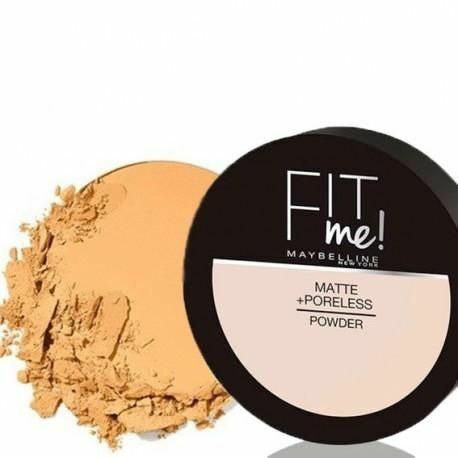 The Fit Me powder can be used with or without the foundation. This powder has no oil, no wax and leaves your skin with no flaws. It was delivered ahead of time. The matte finish stayed long time. The only dwonside is I dont know which is my color, and i thought this was it. I used it for contouring instead.